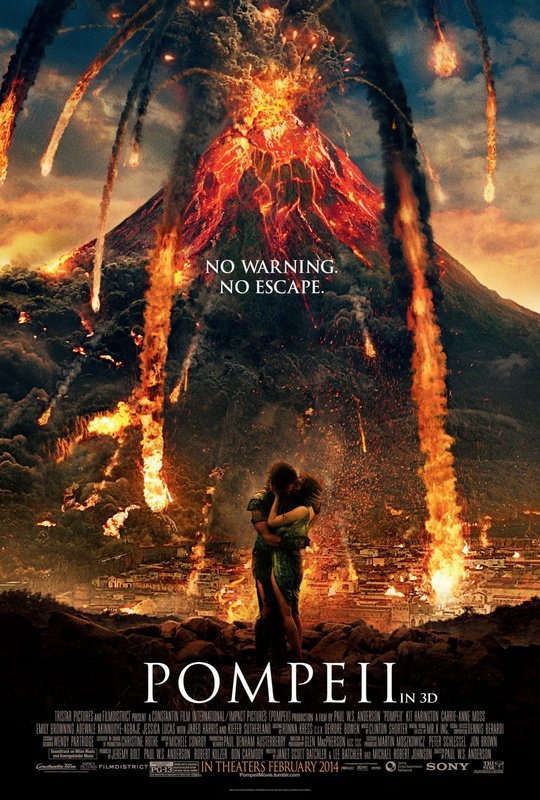 The Short- Pompeii takes the premise of an hour long special on the discovery channel and drags it out for an hour and 40 minutes, most of which is wasted trying to explain a partially formed plot. Pompeii is poorly written with a staggeringly superficial love story that never manages to make a whole lot of sense. The volcano eruption sequence is its only saving grace but bad casting choices and worse direction make it nothing more than a straight to DVD 30 minute special effects spectacle. Paul W.S Anderson is regularly known for making spectacle films with plenty of style and not a lot substance. Movies like Resident Evil, AVP: Alien vs. Predator, and Death Race are only a few on his resume, so it’s no shock that Pompeii boasts a decent cast including Game of Thrones rising star Kit Harrington, Kiefer Sutherland (24), Emily Browning (Sucker Punch), Jared Harris (Mad Men, Lincoln), and Carrie Anne Moss (The Matrix Trilogy, Silent Hill: Revelation 3D). Yet regardless of who starred in Pompeii it still remains a mess of bad dialogue and a poorly scripted love story with a meaningless first hour of set up. The whole point of Pompeii is getting to the point where the volcano goes boom. You wouldn’t think it would have taken so much effort to get there. Pompeii is written by the team of Janet Scott Batchler and Lee Batchler, whose last major motion picture script was the Joel Shumacher directed, Val Kilmer starring Batman Forever. The Batchler’s botched script takes the events of Mount Vesuvius explosion and surrounds it by the story of Milo (Kit Harrington) who after seeing his family murdered at the hands of Senator Corvus is sent into slavery and becomes a dominant coliseum fighter. Milo fights his way to Pompeii where he also catches the eye of the daughter of a wealthy local family. The issues with Pompeii for me were, in all honesty, countless. The relationship between Kit Harrington and Emily Browning is formed by a few longing glances and two formulaic conversations and the chemistry between the pair is almost non-existent. The casting of Kiefer Sutherland as the films living villain Senator Corvus is one of the worst in 2014 so far, Sutherland goes in and out of what seems like a mix of a British and American accent; sometimes forgetting the accent altogether in some scenes and blending the two in others. The direction by Paul W.S. Anderson is to just set up the magnificence of his volcanic eruption, which is fantastic when it does happen, but in the grand scheme of the film Pompeii could have been shortened by over an hour. Nearly every scene ends with a long look at the volcano and then back to the miniscule events happening above the molten hot magma. It’s strange to think Pompeii might have been in better hands under professional destroyer of worlds Roland Emmerich then it was under Anderson. Pompeii suffers from lack of creativity and failure to create a compelling story around the infamous volcanic eruption in history.